Complete comfort and safety are promised to the night automobile driver who will wear a new type of eyeshade. 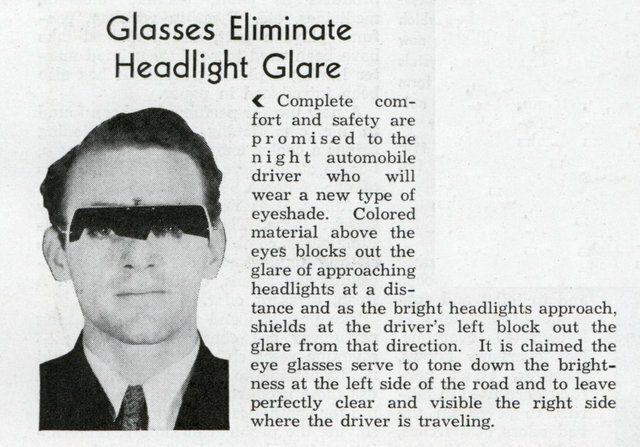 Colored material above the eyes blocks out the glare of approaching headlights at a distance and as the bright headlights approach, shields at the driver’s left block out the glare from that direction. It is claimed the eye glasses serve to tone down the brightness at the left side of the road and to leave perfectly clear and visible the right side where the driver is traveling. This is one of many weird devices that have been featured here to cut down on heaadlight glare.